Free download Password and Key Finder, it is password recovery tool, if you forgot your password of email account, Windows Logon and all that, then you don’t need to worry at all, Password and key Finder is the best solution for it. It will kill your tension and headache. Even it will find the lost keys for you. It is the trial version, hence it has limited features. It is introduced in software market by Spotmau.com. Password and Key finder is very light and easy to use and it is becoming more popular with the passage of time. It has a very nice interface. 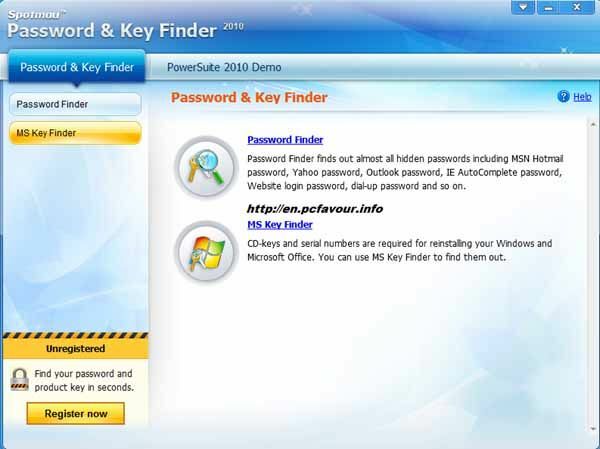 When you open this password recovery tool then you’ll see two options which are; Password Finder and MS Key Finder. Password finder will find out your all type of online services passwords including your email like; Hotmail, Gmail and Google talk, Yahoo and Yahoo Messenger, Outlook, MS Access, Windows logon password. It will also recover your password of social websites too such as; Facebook, LinkedIn, Twitter, MySpace account, Newsgroup, Search Engine account, online shopping accounts and many more. Even it will recover the password of Dialup connection too. While the MS Key Finder will find out the Microsoft products and serial keys e.g. Windows key and Microsoft Office key, if you want to know those keys, then this option will tell you, then you can export those keys into a file and save them. The control panel of Password and Key Finder is very simple and easy. You just need to select an option for recovering password which you want to know and then follow the instructions. If you have any kind of problem during the use of this tool, then it has the online support option in right corner of this tool window. If you don’t know how to use it, then it will give the user manual to know all the features and how to recover the passwords. It supports all Windows.